The vast oceans contain many natural wonders, but they are also home to some astounding additions made by humans. 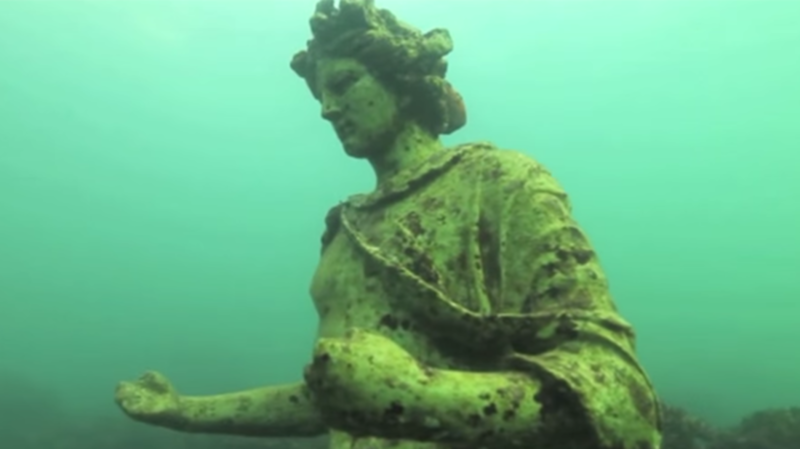 Across the world statues have been sunk into the oceans for a variety of reasons—as memorials, to offer protection to a fragile marine environment, or simply as art. Colored with algae and populated by coral, some of the statues have become tourist destinations in their own right. Famous Italian diver Duilio Marcante conceived the idea of placing a statue of Christ under the water near a popular dive site in San Fruttuoso, near Portofino, Italy, after his good friend and fellow diver Dario Gonzatti lost his life diving near that spot in 1947. Sculptor Guido Galletti received the commission, and created an 8-foot bronze statue of Christ with his arms outstretched. The statue was placed more than 50 feet underwater in 1954 and provides not just a memorial to those who have lost their lives at sea but also a reference point for divers in distress. Christ of the Abyss has become a busy diving site and in 2003 the statue was removed from the ocean for refurbishment after it became corroded and lost a hand due to being hit with an anchor. It was returned to the sea in 2005. The beautiful and affecting statue has proved so popular it has been recast a number of times and copies now exist in St George, Grenada and Key Largo, Florida. In 2010 in Bohol, the Philippines, locals placed two statues 60 feet underwater near a very rare double barrier reef, the Danajon Bank. The delicate marine area had been a victim of overfishing and some fishermen were resorting to using dynamite and cyanide to increase their catch. In order to deter this destructive behavior, two 14-foot statues of the Virgin Mary and Baby Jesus were placed on the sea floor, apparently to remind everyone that God created this special marine environment. The initiative worked, and dynamite is no longer used for fear of damaging the religious icons. Instead, divers flock to the site to admire and pray at the statues. The largest known underwater statue is Ocean Atlas, made by sculptor Jason deCaires Taylor and placed 16 feet underwater off Nassau, the Bahamas, in 2014. The statue was designed to draw attention to the need to conserve the oceans. Ocean Atlas weighs 60 tons and depicts a girl sitting hunched over, seemingly holding up the ocean above her; the piece is inspired by the Greek legend of Atlas, the Titan who held the world aloft. DeCaires Taylor specializes in creating underwater works of art and uses special pH-neutral marine cement, which is intended to last for hundreds of years and encourages coral and seaweed to colonize it, forming an artificial reef. The world’s first underwater sculpture park was created in 2006 in Molinere Bay just off St. George's in Grenada, after the area was damaged by a storm surge. It was hoped that the sympathetic sculptures, also created by Jason deCaires Taylor, would help the sea life regenerate by providing surfaces for algae and coral to cling to. One of the first installations was Vicissitudes, a circle of life-sized figures with interlinked hands, cast from the bodies of local children. More recently, 14 new sculptures based on Amerindian art by local artist Troy Lewis have been added to the park, including a 3-foot high Zemi, or stone idol. Off the coast of Easter Island, home to the amazing carved stone Moai figures, lies an underwater statue that is not all that it seems. The 10-foot tall concrete Moai is not an original ancient statue but a modern replica. Mystery surrounds the origins of the piece—some claim it was created by modern-day residents of Easter Island and placed underwater as a tourist attraction, while others assert that it was a prop created either for a Chilean television show or for a 1994 Kevin Costner movie. 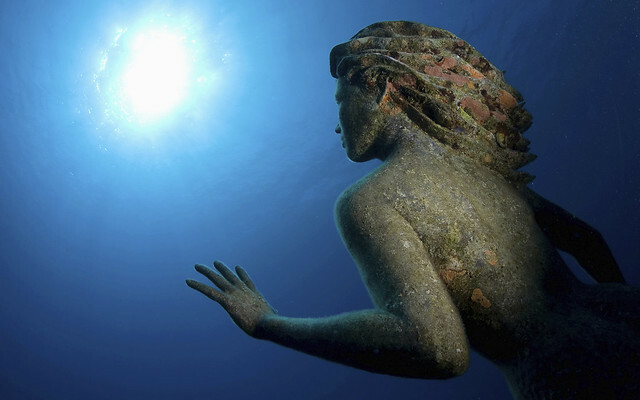 Whatever the truth, the statue has become a popular dive site, especially since the lack of pollution means that the crystal clear waters give divers a great view of the submerged statue. In 2000, the Canadian artist Simon Morris created a 9-foot-tall bronze statue of a mermaid, named for Amphitrite, the wife of Greek god of the sea Poseidon. The 600-pound mermaid statue was sunk under 50 feet of water off the coast of Grand Cayman Island in Sunset Reef (an earlier version also exists in British Columbia). When the statue was put in place, it was lowered into the water using a crane before being towed to its resting place. To ensure the statue did not crack on its journey into the deep, three small holes were drilled into the head of the statue to allow air bubbles to escape. The statue is now a popular place for divers. The Neptune Memorial Reef off Key Biscayne, Florida, was created in 2007 as an underwater mausoleum with statues and memorials constructed from cremated remains. Built in the style of the lost city of Atlantis, the Neptune Memorial Reef is now the world’s largest human-made reef. Those wishing to have their loved one buried in this unique manner can have cremated remains mixed with non-porous cement, which is then fashioned into a statue or memorial stone of their choosing. Mourners (and curious divers alike) can then dive or snorkel the site to explore the vast underwater cemetery and coral garden and pay their respects. In Roman times, Baiae on the Bay of Naples was the equivalent of Las Vegas—a party site packed with lavish villas and populated by the elite. Unfortunately, the bay-side location proved its undoing, since the whole area is plagued by volcanic activity, and the entire city was abandoned by 1500 before being reclaimed by the sea. Today Baiae is a protected archaeological underwater park. Many of the statues have been removed to local museums, but excellent replicas stand in their place, ensuring the ruined temples retain their original character. Tourists can explore the area by glass-bottomed boat, snorkel, or scuba-diving, providing a tantalizing glimpse of this once thriving (and decadent) Roman resort. The Museo Subacuatico de Arte (MUSA) off Cancun, Mexico, is an underwater sculpture park for divers and snorkelers that now contains over 500 statues. Created in 2009, the site covers some 4520 square feet of otherwise featureless seabed and utilizes materials that promote sea life, creating an artificial reef. Six artists have created works for the underwater museum, ranging from interactive stone hoops through which divers can swim to Silent Evolution, the largest exhibit, which features a crowd of 450 life-sized statues. One of the aims of the project is to help protect the nearby natural reefs (which are becoming damaged through overuse) by diverting visitors to MUSA, an otherwise barren area of seabed.